"Connect. World. Yours." Is Nokia trying too hard? 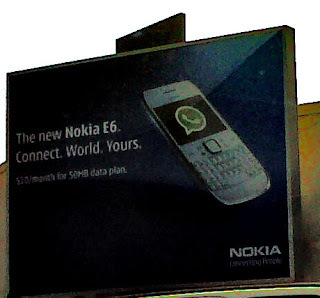 I am not sure what message Nokia is trying to convey to the Lebanese with those three words displayed separately. Are they underestimating the Lebanese public's ability to read and understand a complete sentence? Samsung advertises "Free Whatsapp installation" and Nokia can't even write a meaningful message; what's wrong with mobile phone companies in Lebanon? Nonetheless, my search fell on their Facebook Page, Nokia Lebanon, good interaction with the fans, and useful tips. At least they are doing something right. If i may, it is not that they are understating Lebanese people's IQ level, it's just that they are trying to use the "3 word shock technique" but i agree, it's not the most creative of ads. As to the Samsung ad, that is just pathetic. I get that they are trying to make it appear professional. I hadn't heard of this technique before though. Thanks for bringing it forward. I still think that unless they are trying to highlight a value added, it is useless to bring those words on stage, and "connect to your world" (assuming that's the message) is really not a unique offer these days. This is a technique gone badly wrong. I still think Connect Your World is still a relevant tag line. This printed ad has messed it up. Any idea if it was done "in-house" or to some agency? Last I had heard JWT was in charge of Nokia... I am not sure anymore; and I really don't know about that one. Attack of the bad copy. It had good intentions tho..maybe the copywriter who worked on the account was trying to insert some of his personal style..and ended up messing up the message. Glad I wasn't the only one who thought that looked silly. It's like an elevator pitch gone bad. Nokia Lebanon however, and Nokia MENA in general are pretty good and supportive of their customers and developers.